A new exhibition by Paul Bloomer is always welcome, but this one turns into a mini-retrospective of his work over the last decade or more and covers all the genres he has worked in, except iPod pictures (which are on show elsewhere in Lerwick!). Woodcuts, paintings, pastels and watercolours cover every wall in the gallery and it’s a real feast for the eyes. This is work chosen personally by Dorota at Vaila Fine Art to be displayed, a lot of it for the first time. The dramatic woodcut prints in their monochromatic directness contrast well with the highly coloured paintings mostly featuring birds. They are then out-shone by the small, jewel-like watercolours in the final room. A direct tribute to Hokusai in one of the large woodcuts makes a good start and confirms Paul Bloomer’s debt to Japanese art of the past, but also to the German Expressionists of the first half of the twentieth century who also used woodcut as medium. Bloomer’s work features two seabirds at its centre with the inevitable wave hanging dramatically over them, but full of dynamic movement. Again in Swans at Clousta you’ve a wonderful sense of movement in the three overlapping swans spreading across the rectangle of the paper. It’s Bloomer’s intuitive sense of composition that makes this work so admirable, but also the actual size of the work and the feeling of feverish creativity; the actual digging and scraping away of the wooden surface. I’ve said before of these woodcuts that they are, in essence, almost sculptural. Each one is a study of line, pattern, texture and contain the contrasting elements of stillness and flow. Geese over St. Ninian’s is a good example; the treatment of the different bits of the image are given to different patterns and textures, particularly the knotwork suggesting the tombolo. 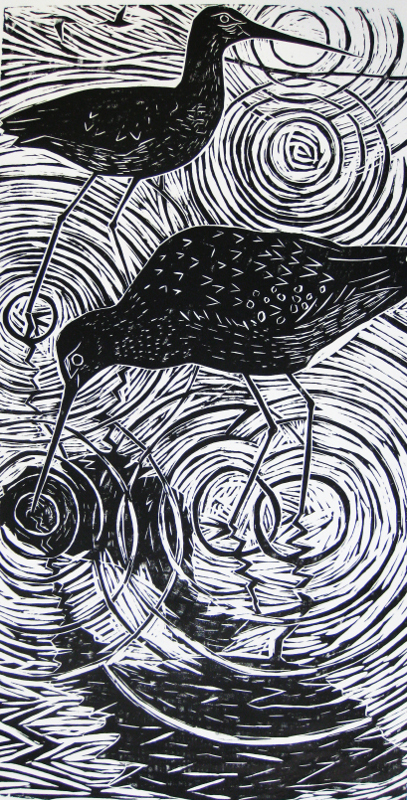 The concentric circles suggesting water in the print; Black-tailed godwits is another. A direct Japanese influence can be seen in A Shoal amongst the Lilies, Lunga Water where you could almost view those lily pads as Japanese hats or umbrellas with koi carp beneath. The print Night Heron has for me memories of his earlier Black Country prints, but here the angst of figuration has given way to the natural world of the birds. And in a way much of this show is about birds, but not so much in an ornithological sense. These are birds as observed and identified by an artist and then transformed into design. A case in point is Yellow browed Warblers from 2008, in which the birds are incorporated into a classically structured image, but always because of its composition and internal rhythm. Indeed such a work is almost ‘musical’ in effect. But Bloomer is also aware of the importance of keeping the image busy, with plenty of elements at work within the rectangle. I’m less of a fan of the bird paintings, but even here one has to express a sense of joy at the use of colour, simple tonal, almost monochrome like the red and black Simmer Dim, Mousavord featuring the iconic concentric circles seen in the woodcuts. There’s playfulness, but also a sense of tension in the use of colour in Red Polls in Bigton, the dancing acidic greens over the dull red beneath with the birds peering in from opposite sides of the canvas. Sometimes, though, the birds in flight become a heavy iconic image fixed in space around a central invisible point and occasionally a bit too ‘lumpen’. They work best when they are graceful. And again as in the woodcuts the birds become design motifs so in Migrants they create a finely balanced painting, not just of observation and emotion, but also display an innate sense of design. Finally it’s the watercolours that clinch this show for me. I share Paul Bloomer’s enthusiasm for making watercolour by grinding and mixing pigment by hand and the sheer joy of playing with pure colour. He writes eloquently about artist Emil Nolde, the Expressionist painter, who used his hand mixed watercolour to create some of the last century’s most intensely coloured paintings where the paper is literally flooded. In Paul Bloomer’s watercolours the paint soaks deep into the Japanese paper, but also evaporates like traditional watercolour leaving a stain on the surface. So the paper needs to be viewed as part of the medium and not something to support an image. There are some lovely effects here: a crusted pigment surface in Dark Cave, Norway or crimson bleeding into turquoise in Stave Kirk, Norway. Although Bloomer says there is “nothing delicate” about this paint, there are a number of subtle effects in the merging and blending of washes and the total chaos of colours. Representatives of the ongoing series Bigton Sunset appear here and all these watercolours are landscape-based. Only in the work Afternoon sun, St. Ninian’s does the effect become muddied and that’s more due to the crunching of orange and blue than any inherent fault in the painting itself. I must mention the way these paintings are presented, floating within their own space in specially created frames suggesting, even more than the other work here, that these are special objects in themselves; indeed a very Japanese concept. The whole exhibition is a delight and I urge anyone with any interest in art to get along to Vaila Fine Art in the next month and have a look themselves.